More than 500 nuclear power plants operate around the world. 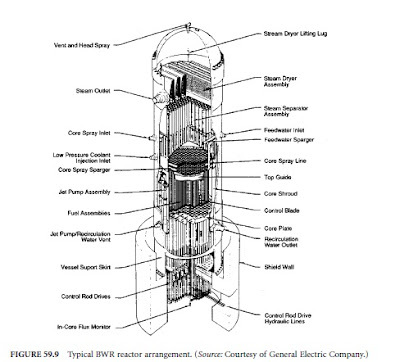 Close to 300 operate pressurized water reactors (PWRs), more than 100 are built with boiling-water reactors (BWRs), about 50 use gas-cooled reactors, and the rest are heavy-water reactors. In addition a few fast breeder reactors are in operation. These reactors are built for better utilization of uranium fuel. The modern nuclear plant size varies from 100 to 1200 MW. Reactor heats the water from about 550 to about 650° F. High pressure, at about 2235 psi, prevents boiling. Pressure is maintained by a pressurizer, and the water is circulated by a pump through a heat exchanger. The heat exchanger evaporates the feedwater and generates steam, which supplies a system similar to a conventional power plant. The advantage of this two-loop system is the separation of the potentially radioactive reactor cooling fluid from the water-steam system. 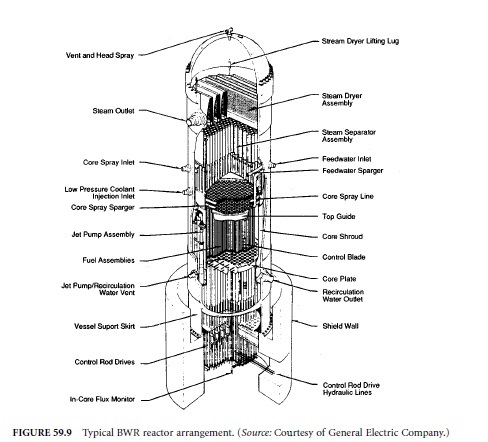 The reactor core consists of fuel and control rods. Grids hold both the control and fuel rods. The fuel rods are inserted in the grid following a predetermined pattern. The fuel elements are Zircaloy-clad rods filled with UO 2 pellets. The control rods are made of silver (80%), cadmium (5%), and indium (15%) alloy protected by stainless steel. The reactor operation is controlled by the position of the rods. In addition, control rods are used to shut down the reactor. The rods are released and fall in the core when emergency shutdown is required. Cooling water enters the reactor from the bottom, flows through the core, and is heated by nuclear fission. In the BWR shown in Fig. 59.8(B), the pressure is low, about 1000 psi. The nuclear reaction heats the water directly to evaporate it and produce wet steam at about 545°F. The remaining water is recirculated and mixed with feedwater. The steam drives a turbine that typically rotates at 1800 rpm. The rest of the plant is similar to a conventional power plant. A typical reactor arrangement is shown in Fig. 59.9. 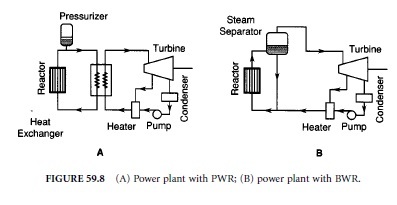 The figure shows all the major components of a reactor. The fuel and control rod assembly is located in the lower part. The steam separators are above the core, and the steam dryers are at the top of the reactor. The reactor is enclosed by a concrete dome.